Staff Photo by Allison Kwesell/Chattanooga Times Free Press - Traffic flows past a traffic camera at the intersection of Dayton Boulevard and Signal Mountain Road in Red Bank. A motion to dismiss lawsuits against traffic cameras argues that thousands of red-light offenders "are not entitled to a trial by jury, a presumption of innocence or a heightened burden of proof." The statement appears halfway through a 36-page court document seeking to stop two $10 million lawsuits against photo enforcement in Red Bank and Chattanooga. Red Bank brought in cameras in 2006, while Chattanooga started using them in 2007. The July 1 motion argues that a camera infraction warrants nothing more than a $50 civil penalty and therefore carries a lower standard of constitutional protection than criminal offenses. "There are several alternative theories, any one of which could be sufficient to dispose of the case," said Red Bank city attorney Arnold Stulce, one of the motion's authors. The motion contests the plaintiffs' argument that traffic cameras unlawfully existed in the two cities before the state Legislature allowed the practice in 2008. It argues that photo enforcement is merely another way for municipalities to enforce basic traffic law. Chattanooga attorney Jonathan Guthrie, who represents the four plaintiffs, said he would file a response sometime before a Sept. 20 hearing in Hamilton County Chancery Court. Tyler Geren, of Chattanooga, and Daniel Houston, of Ringgold, Ga., are the initial plaintiffs in the suit against Chattanooga. Drew Whitley, of Chattanooga, and Alicia Carico, of Lookout Mountain, Tenn., are the initial plaintiffs in the suit against Red Bank. The plaintiffs are up against two recent Tennessee Court of Appeals decisions that denied similar complaints against Knoxville's traffic cameras. Stulce recently referred to the Chattanooga and Red Bank complaints as "almost identical" to the Knoxville cases. The motion stresses that the four named plaintiffs paid their traffic fines without accepting the option to "be heard" in court. It interprets those decisions as admissions of guilt and later characterizes the plaintiffs as people "literally advocating for a right not to be detected violating traffic laws." Since 2006, Red Bank has collected almost $2.2 million in gross revenue from its cameras and funneled more than 60 percent of it to American Traffic Solutions, the Arizona-based company that provides equipment to both cities named in the lawsuit. That leaves $833,281 for city coffers, some of which goes toward paychecks for several city employees who operate the photo-enforcement program, records show. Red Bank City Manager Chris Dorsey said those numbers will nullify the $10 million asked by the plaintiffs, since the city makes only a fraction of that request in gross revenue. 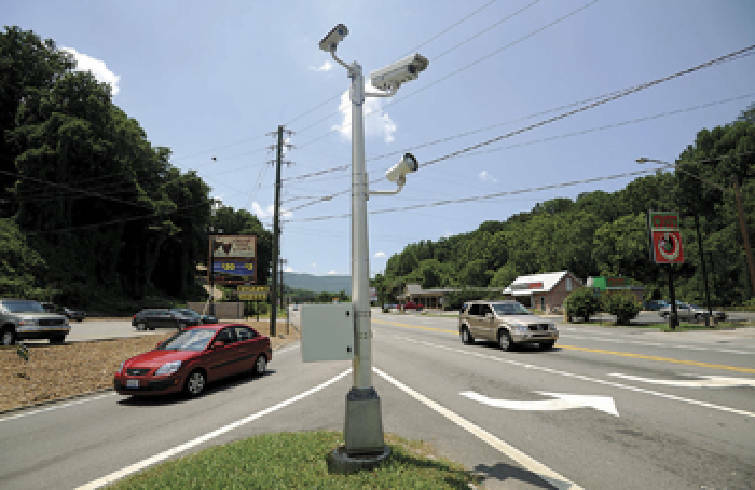 Chattanooga has collected $3.5 million in gross revenue from its cameras, sending $2.5 million to American Traffic Solutions and keeping a little more than $1 million, officials said.